Bill Watkins is known mostly for his 1957 song that became a collectors' record around the world, "Missed The Workhouse." He wrote it about a car and the old Cincinnati jail, built in the mid-1800s. The record is highly sought after by collectors of 1950s rockabilly. Watkins recorded the song for the small Lucky label of Cincinnati. In 1978, Cincinnati's Lee Records released the song on an album of local rock'n'roll. It contained two other original Watkins songs - "Big Guitar" and "Red Cadillac." Watkins' photo is on the front cover of the album, which is distributed internationally. An accomplished songwriter and musician, "Watkins has written songs by numerous recording artists and has played all the instruments on some of his sessions. His song "Time Will Make You Pay" was recorded on Hickory Records of Nashville by the King of Country Music himself, Roy Acuff. It was released as a single and also as an album track in the early 1960s. Bill Watkins - also known as Billy Lee Watkins - was born in Corbin, Ky., on October 2, 1931. Growing up, Watkins lived in the back woods of Tennessee with his sister, Viola, and mother, Martha. His father left home and returned years later. Watkins attended a one-room school that included grades one to eight. Bill dropped out of school at age sixteen and worked on farms and in restaurants. At eighteen, he joined the Army. In 1951, he served in Korea. Music followed him wherever he went. He enjoyed all kinds of music as a child. A family friend allowed him to use an old pump organ when he was five. 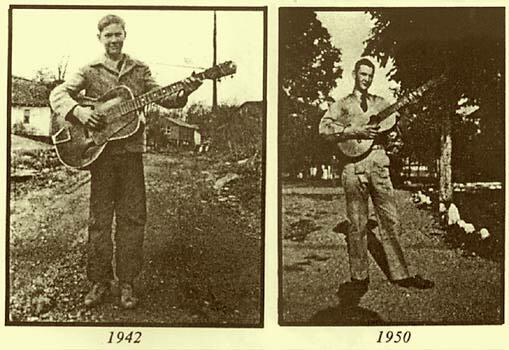 At ten, he experienced his first real taste of music when his uncle, Howard Wilson, bought a guitar and demonstrated it for Bill. At fourteen, he performed on the radio on WCTT's "Moonbow Minstrel Show" in Corbin. Another uncle, Andrew "Bud" Wilson, influenced Watkins to become a songwriter. Uncle Bud read poetry and encouraged young Bill to write poems. naturally, he coupled his with melodies that he wrote on his guitar. After the war, Watkins settled in Cincinnati. Through the 1950s and early 1960s, he worked in a paper mill near Cincinnati by day and at Cincinnati's country music clubs by night. He performed with many top acts, and got to know such performers as Rusty York, who later hit with "Sugaree," and Gene Lawson, the current Nashville recording engineer and drummer who played on "Memphis" by Lonnie Mack in 1963. Watkins bought Lawson his first set of drums. In 1957, Watkins wrote "Missed The Workhouse," about a guy speeding along Vine Street and looking at the pretty girls. 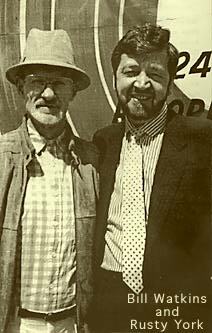 On April 20, 1992, Bill's friend George Whitaker escorted Bill to the old Workhouse in his 1952 Chevrolet. Bill, wearing a cowboy hat, took his wife, Axie, and daughter, Sandra, to the Workhouse for a benefit performance for charity. Watkins had written the song 33 years earlier, and organizers of the benefit wanted him to sing it on stage for history's sake. In the 1970s, he opened Tip Toe Recording with his wife. The couple still operate the professional sixteen-track studio in their basement. Here Watkins recorded two albums that were released in Europe - Return of the Cincinnati Rocker for Rockhouse Records of Holland in 1989, and Bill Watkins, That Rockin' Country Man for Gee Dee Records of Germany in 1991. Meanwhile, Watkins signed with Randy McNutt's General Store Records of Fairfield, Ohio. McNutt, an independent record producer based in Cincinnati, had previously discovered the singer-songwriter Wayne Perry, who also recorded for General Store and wrote numerous hits in Nashville. Watkins and McNutt teamed to write several songs, including the rockabilly "Platinum Blond" (on That Rockin' Country Man compact disc album) and the stone country "Time That Slipped Away," the B-side of a single. With McNutt producing, Watkins hit the American independent charts' top ten with a remake of his "Red Cadillac," a driving rockabilly number featured rockabilly bassist Herman Cress, and "Rockabilly Christmas," a song later recorded by Canada's Michael T. Wall. "Red Cadillac" received extensive airplay in Scandinavia and encouraged Watkins to continue writing songs. 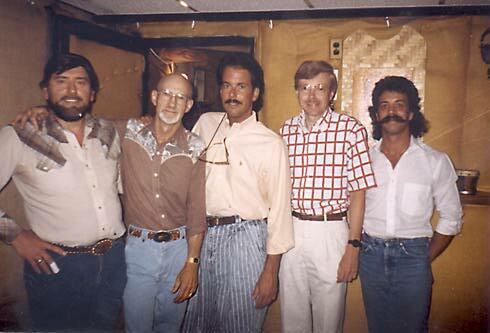 BILL AND FRIENDS (left to right) Herman Kress, electric or upright bass; Bill Watkins, singer-songwriter; George Ciccarone, Cincinnati Channel 12 news reporter; Randy McNutt, Cincinnati Enquirer reporter; Mike Mahaney, drummer. McNutt, who also writes books, featured Watkins in We Wanna Boogie: An Illustrated History of the American Rockabilly Movement (still available for $25 from HHP Books, P.O. Box 18455, Fairfield, Ohio 45018 USA). Based on the story about hm in the book, Watkins says his career was rejuvenated. 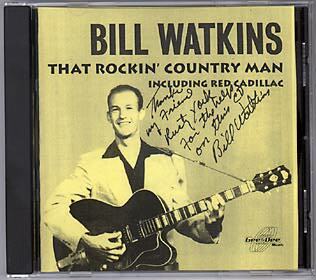 CD - Bill Watkins, "That Rockin' Country Man." These days, Watkins continues to record, write, and sing, but mainly gospel and a few bluegrass songs. He performs for church groups sometimes at benefits. He is recording a gospel album in his studio. "A few years ago, I took Jesus into my life," he said. "There are no words to describe His greatness."